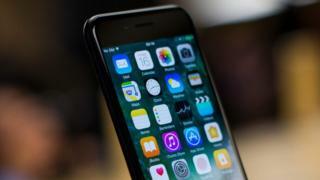 In a statement, the company said the security of the iPhone did not rely on "the secrecy of its source code". The leak of the code- called iBoot - was reported by news site Motherboard. The code began with the statement: "This document is the property of Apple Inc. It is considered confidential and proprietary." Cyber-security expert Prof Alan Woodward, from the University of Surrey, said it was "extraordinary" that the code had been leaked. "The source code for a company's operating system is like the crown jewels - it is guarded very well," he told the BBC. "If there's nothing wrong with the code, it doesn't matter that it's out there," he said. "But Apple should be worried because if somebody has got hold of that, what else have they got? Assuming it is genuine, it has come from the inside somewhere." In a statement, Apple said: "Old source code from three years ago appears to have been leaked, but by design the security of our products doesn't depend on the secrecy of our source code. "There are many layers of hardware and software protections built into our products, and we always encourage customers to update to the newest software releases to benefit from the latest protections."